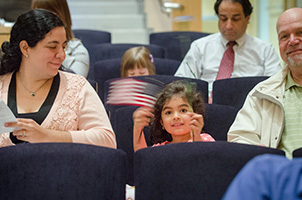 About 50 residents were officially given their U.S. citizenship on Tuesday. 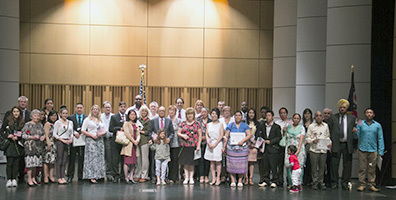 The Naturalization Oath Ceremony, held at the Akron-Summit County Public Library’s Main Library auditorium, awarded citizenship to people from India, South Korea, Burma, Canada, Hungary, Belarus, China, Lebanon, France, Peru, Mexico and Cameroon, among a few dozen other countries. When Judge John R. Adams, from the U. S. District Court for the Northern District of Ohio, rose to address those 48 men and women, the room grew quiet. He asked those participating in the ceremony to stand and to raise their hands. The men and women who hailed from from 30 different countries stood at attention with their hands raised, palms facing forward. Adams spoke the words of the Oath of Allegiance and they repeated his words, each with their own accent and inflection. Some spoke solemnly, but many of them made the oath with a smile on their lips. 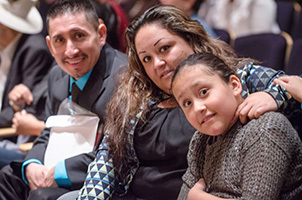 As the names of each new citizen was called out, Judge Adams extended his hand to each of them, congratulating them and passing on to them their citizenship certificates. Derbytown Barbershop Chorus closed the ceremony with the song “God Bless America.” By the time they reached midpoint, most in the room were singing along. Afterwards most of the people assembled there adjourned to the lobby. 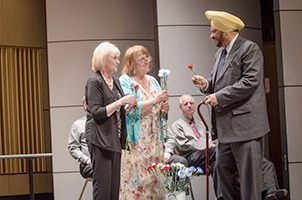 Members from the League of Women Voters invited the newly minted citizens to register to vote. Many eagerly took up the offer and put pen to paper before celebrating with cake and punch in room 2AB. India, South Korea, Burma, Canada, Bhutan, Hungary, Belarus, Philippines, Laos, Bosnia-Herzegovina, Israel, Estonia, Croatia, Egypt, Australia, Colombia, People’s Republic of China, Lebanon, France, Peru, Kazakhstan, Albania, United Kingdom, Jordan, Russia, Gabon, Mexico, and Cameroon lost a few men and women, and we gained 48 new loyal citizens. I hereby declare, on oath, that I absolutely and entirely renounce and abjure all allegiance and fidelity to any foreign prince, potentate, state, or sovereignty, of whom or which I have heretofore been a subject or citizen; that I will support and defend the Constitution of the United States of America against all enemies, foreign and domestic; that I will bear true faith and allegiance to the same; that I will bear arms on behalf of the United States when required by law; that I will perform noncombatant service in the Armed Forces of the United States when required by law; that I will perform work or national importance under civilian direction when required by law; and that I will take this obligation freely, without any mental reservation or purpose of evasion, so help me God. This entry was posted in Neighborhoods and tagged Akron, Albania, and Cameroon, Asian Services in Action, Australia, Belarus, bhutan, Bosnia-Herzegovina, Burma, Canada, Colombia, Croatia, Egypt, Estonia, France, Gabon, Hungary, Immigrants, India, International Institute of Akron, Israel, Jordan, Kazakhstan, Laos, Lebanon, Mexico, Oath of Allegiance, People’s Republic of China, Peru, Philippines, Refugees, Russia, South Korea, U.S. Citizenship, United Kingdom. Bookmark the permalink.